SAN NARCISO, Calif. (Bennington Vale Evening Transcript) -- In September 2014, former President Barack Obama again abused his executive privileges by unilaterally issuing a series of measures to shelter parts of the ocean from businesses, pushing the United States closer to economic ruin and communism. The misguided marine sanctuaries protect wide regions of the central Pacific from fishing, oil exploration and waste disposal enterprises -- powerful market sectors that must be revived to repair Obama’s depressed economy and restore employment to “billions of out-of-work Americans,” according to President Trump. His recently released budget plan aims to overcome these setbacks. Trump’s morally motivated cuts to the National Oceanic and Atmospheric Administration, and other environmental agencies, will seek to end the insidious “ecological fascism” that is eroding America’s greatness through the destruction of corporate fishing, oil spilling and trash dumping industries. By expanding the Pacific Remote Islands National Marine Monument from 87,000 square miles to more than 490,000 square miles, Obama restricted more acres of federal land and sea by executive power than any other president in at least 50 years. And in another kidney punch to hard-working Americans, the policy designated a sprawling off-limits area for commercial fishing companies. A year later, Obama attacked again by broadening the already overblown marine sanctuaries. That executive order allowed protections to extend into Hawaii, his accepted but largely disputed birthplace, encompassing more than half a million square miles. But the trouble-making 44th dictator of the United States was far from finished. Although Donald Trump is loath to rely on unitary decision-making and executive orders -- preferring the input of government officials, Congress and the public -- he has found himself stymied by the autocratic mandates of Obama. The proposed budget represents Trump’s urgent need to repeal all of his predecessor’s dangerous policies. The aggressive blueprint will roll back progress on renewable energy and public health while hollowing out environment protections -- all impediments to growth. By placing such a large expanse of ocean off limits, Obama immediately drove a fatal nail into the watery coffin of the U.S. fishing industry. Even worse, the ocean sanctuaries prevent oil companies from drilling. Obama consistently vowed to end U.S. dependence on foreign oil throughout his presidency, yet by shuttering operations in the Pacific, America would be forced to begin purchasing even larger quantities of oil from abroad. Republican leaders assured voters that they, in cooperation with the Trump administration, will refuse to sponsor any motions that increase spending for oil produced overseas. They endorsed the wiser, more responsible alternative of starting another armed conflict with a sovereign, oil-rich nation in the Middle East -- plans that Steve Bannon is currently drafting. Apart from the obvious perils of food and oil shortages, Olden-Whitely cautioned against another terrible threat facing the United States under existing Obama policies. But the interpretations of Trump’s policies as anti-conservation are largely misgiven. 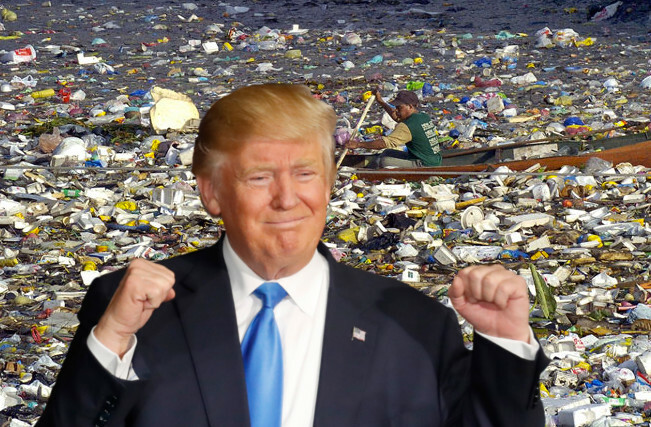 His foremost concern is protecting business interests, American workers and the economy through measures that safeguard the planet’s resources more reasonably. On January 26, for example, Trump issued a “climate-friendly energy plan” to create jobs, restore a dying industry and provide low income families with affordable fuel and food: the resurrection of commercial whaling. (c) 2017. Licensed under a Creative Commons Attribution-NonCommercial 3.0 Unported License. All articles are works of satire. See disclaimers.